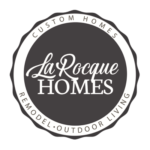 At LaRocque Homes we don’t want to just build you a house, we want to build you a home. We believe your home is a place to build cherished memories with your family and friends. Each home is unique and crafted specifically for the client in mind. We believe that Integrity in Building is the cornerstone for our foundation, and everything we do will be Honest and Transparent. We relentlessly pursue excellence in building materials, craftsmanship, and process and maintain that communication is one of the most important keys to a successful project. Designing a home that will fit your needs and comfort for a lifetime. We are truly your Custom Home Builder. We believe in the quality of our work and take pride in knowing our clients feel the same. Below are some customer testimonials we have received. If you would like to ask any of our clients about our work, contact information is available upon request. When you're ready, contact the LaRocque Group to get started on turning your dream into a reality.